Virtually everyone experiences hiccups, but they rarely last long or require a doctor’s care. Occasionally, a bout of hiccups will last longer than two days, earning it the name “persistent hiccups.” Very few people will experience intractable hiccups, in which hiccups last longer than one month. A hiccup involves the coordinated action of the diaphragm and the muscles that close off the windpipe (trachea). The diaphragm is a dome-shaped muscle separating the chest and abdomen. It is normally responsible for expanding the chest cavity for inhalation. Sensation from the diaphragm travels to the spinal cord through the phrenic nerve and the vagus nerve, which pass through the chest cavity and the neck. Within the spinal cord, nerve fibers from the brain monitor sensory information and adjust the outgoing messages that control contraction. These messages travel along the phrenic nerve. Irritation of any of the nerves involved in this loop can cause the diaphragm to undergo an involuntary contraction, or spasm, pulling air into the lungs. When this spasm occurs, it triggers a reflex in the throat muscles. Less than a tenth of a second afterward, the trachea is closed off, making the characteristic “hic” sound. 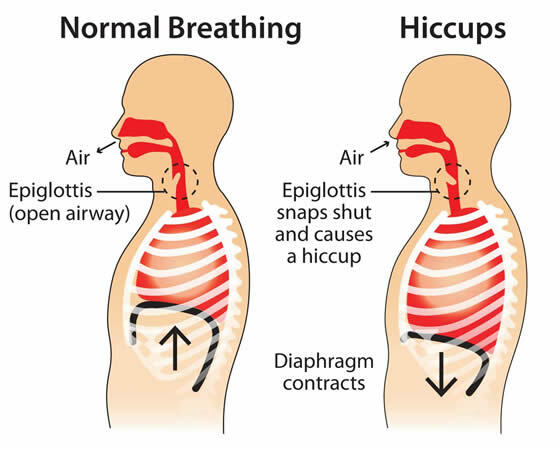 Hiccups can be caused by disorders of the central nervous system, by injury or irritation to the phrenic and vagus nerves, and by toxic or metabolic disorders affecting the central or peripheral nervous systems. They may be of unknown cause or may be a symptom of psychological stress. Hiccups are diagnosed by observation and by hearing the characteristic sound. Diagnosing the cause of intractable hiccups may require imaging studies, blood tests, pH monitoring in the esophagus, and other tests. Holding one’s breath for as long as possible. Breathing into a paper bag. Swallowing a spoonful of sugar or peanut butter. Bending forward from the waist and drinking water from the wrong side of a glass. Acupressure techniques can also be helpful in eliminating hiccups. Acupressure is a Chinese medicine treatment that involves placing pressure on different points of the body, called acupoints. It is based on the premise that good health is based on a harmony of energy flow, or qi, throughout the body. By placing pressure on acupoints, qi is balanced and harmony—and health—is restored to the patient. To treat hiccups through acupressure, rest the heels of the palms on both cheekbones while placing hands over the eyes. Massage the temples by pulling the thumbs in towards the palm. After massaging, remove the hands from the eyes and lightly press the tip of the nose with a fingertip. Some cases of hiccups can be avoided by drinking in moderation, avoiding very hot or very cold food, and avoiding cold showers. When carbonated beverages are drunk through a straw, more gas is delivered to the stomach than when they are sipped from a container; therefore, avoid using straws.